A GMO maize variety that has been in the food and feed supply for years is not substantially equivalent to its non-GMO counterpart, the results of a new peer-reviewed study show. The study, published in Scientific Reports, also shows that the changes in the GMO maize resulted from the genetic engineering process and could have implications for the health of people and animals that eat the maize. Yet these changes were not taken into account in the European Food Safety Authority’s (EFSA’s) risk assessment – suggesting that a new evaluation must be performed on the basis of up-to-date science. The basis of GMO approvals worldwide is the concept of substantial equivalence, meaning that the GMO maize is compositionally the same as the non-GMO counterpart (nearest relative). In 2009 the EFSA GMO Panel concluded that “maize NK603 is compositionally equivalent to conventional maize”, except for the intended change – the presence of extra proteins that make the maize tolerant to glyphosate herbicides such as Roundup. However, the new study, by a team of researchers led by Dr Michael Antoniou at King's College London, shows that EFSA’s conclusion is false and that the genetic engineering process has had far-reaching unintended effects on the composition of NK603 maize. The researchers’ in-depth analysis of the types of proteins (“proteomics”) and small biochemical molecules (“metabolomics”) revealed major differences between NK603 maize and its non-GMO counterpart. 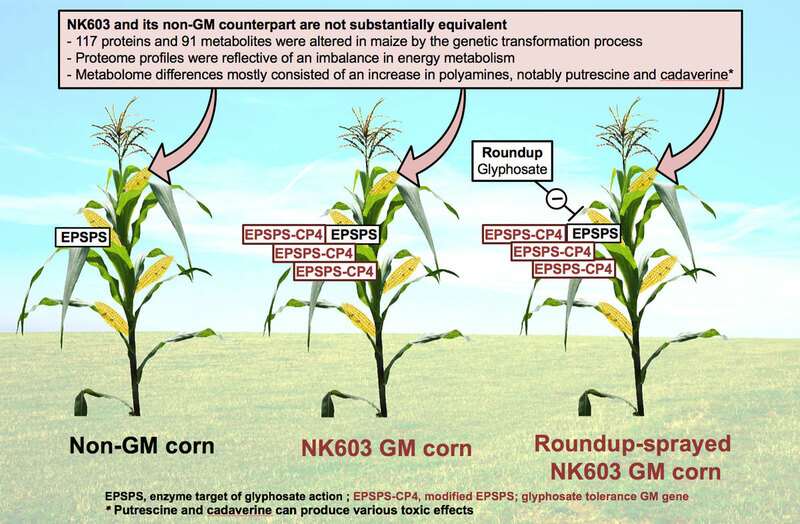 A total of 117 proteins and 91 small molecule biochemicals (metabolites) were found to be significantly altered in NK603 corn by the GM transformation process. The GMO and non-GMO maize were grown in the same location and under the same conditions, ruling out the possibility that environmental factors such as the spraying of Roundup or different growing soils caused the differences. The results of the analysis showed disturbances in energy utilisation and oxidative stress (damage to cells and tissues by reactive oxygen) in the GMO maize. There were also, in Dr Antoniou’s words, “worryingly large increases” in substances called polyamines. Polyamines found to be present in increased amounts in GMO NK603 corn included putrescine and cadaverine. To non-scientists, these substances might sound like something that oozes from dead bodies. And they wouldn’t be wrong. As Wikipedia tells us, “The two compounds are largely responsible for the foul odour of putrefying flesh” – as well as contributing to the smell of bad breath. Mmmm… lovely! There is no indication in the EFSA assessment of NK603 maize that Monsanto measured these compounds in the crude compositional analysis it carried out to gain regulatory approval. The actual maize tested in the new analysis was previously found to give rise to signs of toxic effects in rats, notably liver and kidney damage, in the Séralini 2-year feeding study. Could the increased levels of cadaverine and putrescine found in the NK603 maize samples account for these apparent health effects? Dr Antoniou said this question “needs to be further analysed in long-term animal feeding studies, using methods that specifically and more accurately quantify the amounts of these polyamines and their effects”.